Does 6 Degrees of Separation Still Exist? This post all started when I was talking at the LearnNow DL conference in Burnaby on April 19th. 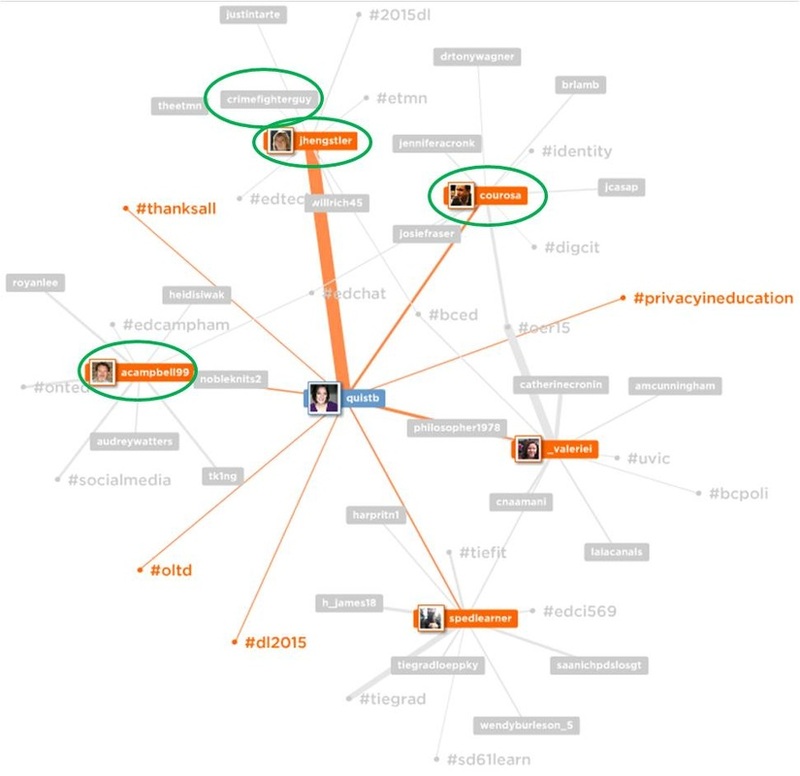 I was speaking about privacy in education (if you follow me on Twitter, @quistb, you will notice that #privacyineducation is my most used hashtag) as that was the focus of my masters work. While I was working through my presentation we came to a slide of my Twitter Mention Mapp. A Mention Mapp takes your twitter handle and shows who you connect with the most on Twitter – this includes the first degree connections, second degree connections and the most popular hashtags. When I showed the one that I had completed for my OLTD 506 course (5 months into Twitter) I showed that out of all the connections shown, there were four unknown to me connections. This means connections that I had not directly contacted or someone that I did not know at least who they were in some context. Fast forward to this spring when I was getting my presentation together - I remembered back to the Mention Mapp in September of 2013 and I wondered how my Mention Mapp had changed in the year and a half since. I went to the website again (www.mentionmapp.com) and typed in my Twitter handle. I was shocked! I went from four unknown connections to only 4 known connections, although I still did know the connection of most of the hashtags, and then this blog post idea was suggested. I remember the first time I was told about the concept of “6 degrees of separation”, it was a few weeks after I had arrived home from a summer camp I had attended that year. For me it was an interesting concept as the premise is that between you and any other person in the world, you can trace the connection through no more than 6 people. The reason it was so awesome at that point was the fact that I had just met a person at my summer camp who was cast in two Hollywood movies. Through that he knew a few big name actors such as Vin Diesel and Seth Greene. Since that was only two degrees of separation, I then realized I was probably no more than three or four degrees from most Hollywood actors. Fast forward 12 years and now we have Facebook, Twitter and other social media sites. We are now more connected that ever before in history (although the strength of some of these connections can be debated). Have a friend from high school you haven’t seen in a while? Search for them on Facebook and catch up within a few minutes of looking at their pictures and ‘about me’ page. Want to know what is new and exciting in the life of your favourite celebrity or sports star? Follow them on Twitter or search for them on Google. I remember the day that Taye Diggs started following me on twitter, I had watched Private Practice so I knew who he was but I thought it must have been some kind of mistake. When I went to Twitter and saw on his page that he was Twitter verified (verification is currently used to establish authenticity of identities of key individuals and brands on Twitter.) I knew that it was an actual celebrity that I knew and I was excited. I went on to see that he follows 300,000+ people but still – I am one of those! Although we do not have communication and I am not able to pick up the phone and talk to him, as cool as that would be, I still have a platform where our degree of separation is reduced to one. What about you? 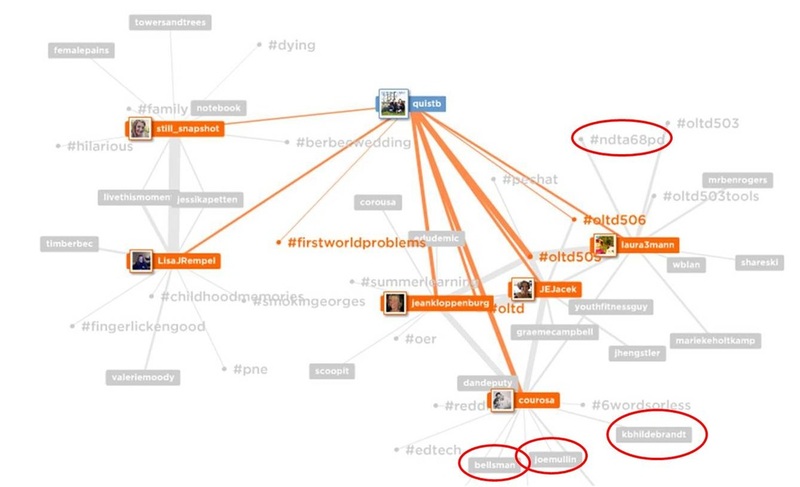 What does your Mention Mapp look like? I suggest you check it out, you may be surprised! A big thanks to @jhengstler for urging me to start blogging. Breanne is a M.Ed graduate from the Vancouver Island University Masters in Educational Leadership program. She focused her work on Privacy in Education.